Yes friends, its time for another postcard from our dear jet setting Bunny. Lately, she and her beloved husband Benedict have been exploring the Amazon, riding down the treacherousness river on a home made luxury yacht and meeting people of all types throughout South America. While on this journey, Bunny had the great pleasure of enjoying cocoa beans in their purest form. It took quite a while to acquire a taste for the bitter little things, but very soon Bunny began to appreciate the raw, bitter, dark chocolate properties of the beans. Taking a small break to return to civilization (and a WiFi connection) Bunny discovered a company out of Utah called Crio Bru, specializing in a very special sort of beverage made from the very same cocoa beans. This product treads the line between premium coffee and quality drinking chocolate: whole roasted cocoa beans from different regions all around the world from the Dominican Republic to the Ivory Coast are ground and hand sifted in order to be brewed in hot water, just like coffee (Bunny found she preferred using the French press method rather than percolating). The result is not quite as thick and rich as a hot chocolate, but not as heavy and acidic as coffee. Cream and/or sugar can be added to the drink, again just like coffee, for a more decedent experience. Different beans from different regions have different flavor notes, like toasted coconut or ripe red berries. Bunny loved the subtle, yet deep chocolate flavor, and as cocoa beans are non-caffeinated and are rich in anti-oxidants, this beverage had a few more healthy properties than the previously mentioned choices. There's a rumor that Crio Bru is working on a Espresso version of their product, which Bunny is whole heartedly in favor as, as the only fault she found in the drink was that it was a tad on the weak side (but the aroma of the grounds is something out of a Willy Wonka crafted dream). Though the concept of brewed chocolate is a little hard to get one's mind around, Bunny encourages you all to check out Crio Bru's website and try it for yourselves! *The products featured in this post were provided to the writers of this blog for review by the manufacturers. All opinions are honest and have not been influenced by any sort of compensation. Every year as the craziness of the holidays comes to a close, the world seems to loose its sparkle and magic as it descends into cold, dark winter. The snow no longer seems mystical, the lights of buildings faded, and the people on the streets seems to become more sullen and isolated. For Brandy, this has always been her least favorite time of year; a time when the populace seem to forget the good will they had cultivated over the previous month and the baubles all over the city that once glittered seem dull and pointless. With her prestigious guest, Mama Bee, still in town, Brandy set out to restore a little bit of the holiday magic. She chose Wood, a fairly new cocktail lounge and bistro in the heart of Lakeview. Brandy had been attracted at first by a glittering wall studded in mosaic mirrors that shone like diamonds ("Or a disco ball," as Mama Bee pointed out), but once the ladies walked inside, they were greeted by the host like they were old friends. Taking them to a table by the window straight away, the ladies quickly settled into the chic, yet warm and friendly room. "It's fashionable and glittery, yet welcoming. Very much a representation of this neighborhood," Brandy observed. Cocktails were quickly ordered. For Brandy, a concoction called the French .75, a mix of champagne lemon, and gin which Brandy found quite refreshing, sort of like a hard lemonade. Mama Bee picked the Fuzzy Mimosa, a fusion breakfast cocktail, taking the foundation of a traditional mimosa and adding a little touch of peach bitters. "Seems to be fresh orange juice," Mama Bee observed, "It's a lovely twist, but not so far off that its unrecognizable." Mama Bee decided to veer away from her famous sweet tooth and ordered a plate of the House Corned Beef. The dish was hearty, filling, and extremely flavorful, if a tad salty. The meat was melt-in-the-mouth tender without being too fatty and the eggs on top just added to the richness. The only disappointment was the side of toast, which seemed to have been done in a wood fired oven; charred, dried, and burnt tasting, the toast was hardly even worth eating. "I understand that they want to use their restaurant's name sake as much as possible," Mama Bee (honey advocate and owner Honey Bee Bakery), "But simply putting the bread in a regular toaster might not be such a tragedy." Brandy went for the Autumn Vegetable Flatbread, which was also cooked in the wood fired oven. In this case, the results were perfect. The flatbread had a nice toasty flavor from the oven and was crisp and full of texture. The cheese on top was perfectly melted and savory, but Brandy was disappointed to see that the "autumn vegetables" were simply a few mushrooms. "You would think some squash, surely, or perhaps a little eggplant," she mused, "It's very good, but they should have just labeled it 'Mushroom Flatbred' as opposed to making one expect something else." To end the meal on a sweet note, the ladies shared a plate of the Stuffed Apple Cinnamon French Toast. Once again, a perfectly good dish seemed to have been mis-named, as the toast was more stacked than stuffed, with the filling sandwiched between slices rather than being on the inside of the them. The French toast itself was really quite perfect in its custardiness, a flavor sometimes taken for granted in other fancy-fied French toasts. The apples retained a bit of their texture and tartness, the sauce's sweetness was not over powering, and marscapone cheese lent a brilliant bit or richness and creaminess to the plate. The service at Wood could not have been more friendly ("Flirty even," Mama Bee giggled) and the prices were more than fair ("$5 for brunch cocktails? That's practically unheard of!" Brandy raved). So with their hearts a little lighter and their bellies a little fuller, Brandy and Mama Bee set out to transfer a bit of their good mood onto the gloomy winter streets of Chicago. Perennial Virant or Lighten Up! There are times in life when a ball gown is essential. Debutante balls, royal wedding receptions, ballroom dancing championships, and sometimes extremely formal flower shows are life events where one would be scoffed at and scorned if not decorated in the required amount of gemstones, silks, and/or velvets. Brandy learned this to her horror on one occasion when she attended a combination piano recital and birthday party for the youngest daughter of the Duke of Basingstoke. "The girl is turning eight, for goodness' sake, I don't need to wear a floor length gown," she had said, and decided instead upon the more sensible outfit of a tweed knee length skirt and matching jacket. When she arrived to find every woman in sight dressed to the nines with miles of sparkling fabric trailing behind them, rather than feel under dressed, she simply laughed in their faces, turned on her heal, and left the party (passing the butler her phone number on the way out). Needless to say, Brandy has never had the patience for needless formality, which perhaps is why she has always favored taking her most honored guests and friends out for brunch instead of dinner. "Dinner at some of the finer restaurants in this world can become too much about the rituals of dressing up, showing up, and showing off. No one does that for brunch. You put on the first thing you see in your closet because its too damn early to be picky, and then its out the door and on with the meal," as she puts it. So when one of her most prestigious guests, Mama Bee, owner and operator of Honey Bee Bakery, came to town, Brandy didn't think much about picking the normally decorous Perrenial Virant in Lincoln Park. "What's the dress code?" Mama Bee asked. "Dress code? Well, if it was dinner, maybe a little more formal, but this is brunch for goodness sake! Wear whatever you like." Perrenial Virant's sunny dining room wasn't nearly full, but still Brandy was glad she had made a reservation after the suspicious look the hostess gave her when she and Mama Bee entered the restaurant. Glancing around quickly, Brandy noticed the staff were dressed quite informally ("Thank goodness," she sighed audibly) in jeans and button down shirts, and although the interior had been decorated appropriately for the holidays, there was still a certain stiffness in the air. Seated straight away, the ladies ordered a pair of cocktails: a Strawberry Mimosa for Mama Bee and a concoction called The Flying Nunn for Brandy. The mimosa was one of the most well balanced Brandy had ever come in contact with, being made of a clearly high quality champagne it wasn't overly sweet or acidic. The Flying Nunn was a mix of peach schnapps, ginger beer, cognac, and orange and made for a rather uniquely fruity drink that fitted in perfectly with the hour of the day, a feat that isn't always met by other supposedly breakfast cocktails. 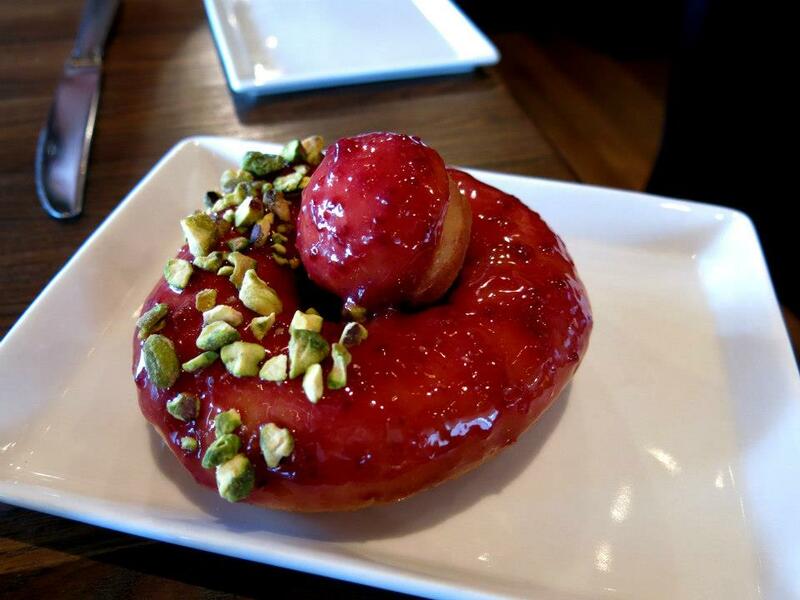 To start off the meal, Mama Bee and Brandy decided to split one of the Housemade Doughnuts, a round of fried yeasty dough covered in raspberry glaze and chopped pistachios. The glaze was bright and fruity, a nice contrast to the richness of the doughnut itself, and the nuts made for a brilliant bit of crunch. In fact the only disappointment was the long, dark hair attached to the top of the pastry, which certainly did not belong to Brandy, Mama Bee, or their short haired waiter. Entrees came out lightening quick. Mama Bee had chosen the Croque Madame with a side of Home Fries and Cheese Curds. The bread of the Croque Madame was nicely supple and perfectly toasted, the ham tender and flavorful, and the whole thing set off with a subtle sweetness from some maple syrup flavored sauce. "I would have gone with honey, of course, but this is quite good too," Mama Bee remarked. The home fries were wonderfully crisp, but combined with the un-melted cheese curds, the dish seemed rather dry. "No wonder the Canadians pour gravy over this," Brandy mused. Speaking of gravy, Brandy had been given quite a lot of it with her Biscuits and Gravy, along with a side of Cheesy Grits. Brandy found the biscuits to be rather crunchy, if slightly salty, and the gravy to be surprisingly light. The eggs that topped off the dish were also cooked perfectly, and the large chunks of seemingly case-less sausage made the dish nicely filing. Brandy quite adored her grits, which seemed to have been made with some sort of smoked Gouda rather than the more traditional cheddar. Their texture was amazingly smooth, creamy, and for having paid $5 for the bowl, the portion size was appropriately sized. Though it was hard to imagine better food, the choreographed and stiffly formal service and atmosphere put Brandy off. "It's just brunch, for goodness sake! It's not like they're serving truffles and caviar!" she growled as they packed up, "If those poor servers were just told they could have a bit of fun and if the decor could have had a bit more life in it, that might have been one of the loveliest brunches of my life." There is a saying in the world of theater: "A bad dress rehearsal means a perfect opening night." Its a thing that many a harried director clings to as he watches set pieces falling down around his actors and knows there is nothing he can do about it, except for praying to every deity in existence that the nails will hold up the following night. Usually everything turns out just fine, but on occasion, there is a disaster so horrible that it can not only end the run of the show, but a few careers as well. A director friend once asked Brandy to sit in on a preview for a show so disastrous that not only were the jobs of the actors under threat, but their lives were as well. It was a musical based on the life of Sigmund Freud (Brandy had been invited to give her opinion as she once dated Dr. Freud, but claimed he was a bit too much of a "mama's boy" for her liking) and the big show stopping number at the end of the first act was a song called "Do The Freudian Slip," which included an incredibly complicated dance number in which all of the bright faced chorus boys and show girls would literally slip into each other repeatedly, launching prat fall after prat fall onto the stage and causing the floor boards to creak ominously below them as they landed. Eventually the dainty figure who was playing the main role of Dr. Freud's secretary, a fresh faced ingenue by the name of Bambi Buttercup, threatened to walk out of the show when she was almost tossed into the orchestra pit by a sliding kick line. Taking initiative, Brandy met the young woman in her dressing room back stage and offered her this sage advice, "Get out while you still have all your limbs intact." Bambi promptly quit the show and spared herself the fate of her replacement, who broke both legs during the first week of the production. Needless to say, Bambi kept in close contact with Brandy after that, calling to consult with her on various career moves throughout the years. Brandy was delighted when Buttercup phoned her one day to let know that she and her manager husband, Bear, would be coming into Chicago for New Year's Day. "I'm currently touring through the Midwest with Andrew Lloyd Webber's new show," (Brandy later found out this show was Evita 2: Go Ahead and Cry Argentina) "And we would love to see you!" "Of course! I've got plans with some friends to go to brunch that day, but you are both welcome to come along. It should be a spectacular one," Brandy said. "Oh now," Bambi scolded her, "Don't tempt the gods like that!" Brandy gathered together with Bambi and Bear, as well as her dear friends Bailey and Hawke, at Slurping Turtle, the latest venture from one of her favorite Chicago chefs, Takashi Yagihashi (he had actually recommended she stop by when Bunny interviewed him last summer). Her expectations were admittedly pretty high, seeing as how Takashi had been one of her all time favorite brunches. Slurping Turtle has only recently begun serving brunch on Sundays, but were open for a special brunch on New Year's Day, promising a free order of Donut Holes and a gift certificate for 50% of the total bill to anyone who showed up in their pajamas. Brandy had come full out in her tartan night gown, lace sleeping cap, and lamb's wool slippers, while Bailey and Hawke sported matching flannel sets that had been embroidered with a woodchuck motif. Bambi had some how managed to still look like the starlet she was, draped in a silken bathrobe with a feathered collar, but her husband had taken some convincing, as he normally didn't like to step out the door in anything that wasn't a three piece suit. The restaurant was surprisingly busy, forcing the group to wait for about 30 minutes before being seated. They were taken to a somewhat narrow table, which was shared by another party of 3 rather territorial people. Though the entire staff of the restaurant was also wearing their pajamas (a stark contrast to the ultra modern, industrial chic interior) their hearts did not seem to be in the spirit of the thing, rushing in and out of tight spaces with dower faces, avoiding eye contact with every patron. Brandy couldn't really blame them, as chaos seemed to be reining everywhere, even on the menus, as the party had been provided with two different sets of them and no one could figure out which one held the actual items available. Brandy started herself off with a Kir Royale Mimosa, a rather syrupy concoction with no garnish to even attempt to justify the $10 price tag. Bear ordered himself a plate of chef Takashi's famous Duck Fat Fried Chicken, which immediately put him in a better mood. Moist on the inside, crispy outside, nice sweet sauce, and a spicy Asian slaw on the side meant a good mixture of flavors and textures to snack on as the group waited for their entrees. And waited they did. Brandy was rather surprisingly supplied with her entree quite quickly, but no one else's seemed to be forth coming, so at their urging, she started to dig in. Brandy had ordered one of the signature Bento Boxes, the house brunch specialty of Slurping Turtle that distinguished it over its sister restaurant. Brandy's variety contained some pickled daikon radish, edamame, sesame rice, marinated black mushrooms, two slices of tamago (rolled, sweet egg) an unexplained cup of various vegetation, and some beef short rib with tofu. The presentation immediately seemed off to Brandy, as several of the selections had been dished into plastic cups and shoved into the bento box. "I've seen more delicately plated bento boxes at all you can eat sushi restaurants. Very strange indeed," Brandy mused. While the various vegetable sides were pleasant enough (Brandy found them mostly crisp and flavorful) the rib eye was down right disappointing. Sliced thinly, it was plenty tender, but very dry, and without the flavorfully sweet broth that it sat it, it would have also been flavorless. With a hefty price of $18, Brandy was very surprised indeed at the quality of the dish. Her bento box also came with a small bowl of Miso soup, which was brought to the table after her entree, but before everyone else's, and without a spoon with which to consume it. Once a spoon had been aquaired, Brandy and Bambi (who had also ordered a bento box) dove into their soups with gusto. They found the soup to be quite rich and deep in flavor without being too heavy or salty, as miso can sometimes be. A bit later, entrees began to arrive for the rest of the table. Bambi, who had ordered a Temura Bento Box, also found hers to be a bit of a let down. The tempura was crisp, but bland, and surprisingly included chicken, although it had been labeled as "shrimp and vegetables." Normally this oversight would be excusable, but Bambi, being a pescitarian, was rather saddened by the discovery of the chicken, as it could have easily been mistaken for something else by being hidden in the tempura batter. The rest of her sides were the same as Brandy's: she rather liked the tamago, but found the texture of the mushrooms to be a bit too rubbery. The other three had ordered a variety of noodle bowls: the Miso Ramen for Hawke, The Slurping Noodle for Bailey, and the Tonkotsu for Bear. Having previously had chef Takashi's noodle bowls, Brandy soon became jealous of her cohorts' choices, covetously starring down the generous portions of noodles while the others ate. Bear found his bowl fairly flavorful, especially the braised pork shoulder, but didn't think the dish anything special. Bailey's bowl was nicely earthy with a good hit of cilantro to brighten things up. But the decided winner was Hawke's bowl, which had a wonderful spice to the broth that reminded Bailey of a jambalaya. Having over heard Brandy's grumbling about her bento box, their waitress sent over a manager who seemed to earnestly want to make things up. "Tell you what. I'll go ahead and take the bento box off the bill, and then I'll have the pastry chef send over something special How does that sound?" Brandy agreed to the plan, now feeling better about taking all of her friends to such a chaotic brunch. The dessert sent over turned out to be five of the house made Macaroons, flavored in Caramel Soy, Yuzu, Chocolate Sesame, and Raspberry Wasabi. The Raspberry Wasabi was a bit of a disappointment, in that one could only really taste the fruity jam and none of the expected heat. As far as favorites were concerned, the table was split between the salty goodness of the Caramel Soy and the richness of the Chocolate Sesame. At last, the table was presented with what was to be their reward for coming in their pajamas, but the Cinnamon Sugar Brioche Donut Holes were probably the biggest let down of all. One tiny fritter was given to each of them, rather like a plate of mints, with the bill. The party of five rang up a total of about $90 (that was without Brandy's bento box, but did include the macaroons, which Brandy had expected to be comped) and they were given a $50 gift card, as per the second part of the promotion. Brandy handed the card to Bailey and Hawke, feeling so disappointed by what she had expected to be a spectacular brunch that she really had no interest in ever returning. "Look at it this way," Bambi said, trying to cheer her up, "Maybe this is just their dress rehearsal. Some day, they are going to have a really brilliant opening night." "I hope so," Brandy sighed, "Otherwise they may just find themselves slipping into the orchestra pit."